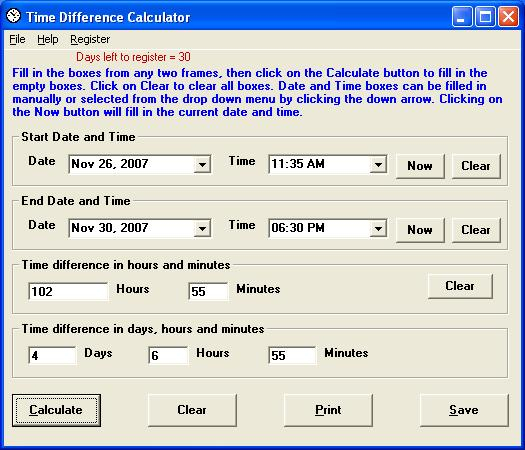 Time Difference Calculator 1.1.0 - Download Win Apps. Calculate time between 2 date/times, or date/time a given time from a date/time. TDC calculates the number of days, hours, and minutes between two dates and times. It will display the time difference, both as days, hours, and minutes and entirely as hours and minutes. It also calculates the date and time X hours and Y minutes before or after a given date and time. Input time differences either as days, hours and minutes or entirely as hours and minutes. Print results and/or save to a file. C-Value!, solve for any unknown value, for all time value of money calculations. Create schedules for loans, leases, saving plans, investments and judgements. C-Value! is an excellent tool for tracking loan balances and payments. It has 5 main purposes: Calculate target date & time by adding/subtracting some time elements (months, days, hours. ) based on a specified time. Calculate time differences between two times. Count days of week/weekdays/weekends between two dates.